Who was your sports hero when you were 8 years old? Mine was, without question, Chicago Cubs right fielder, Andre Dawson. He had a tremendous swing, a laser rocket arm, a golden glove, and an intensity that was unmatched by most who played the game (his nickname was The Hawk). 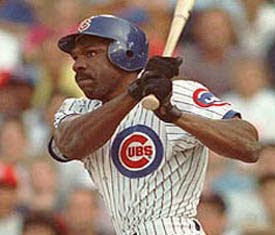 I wanted nothing more, as an 8 year old kid, to grow up and be just like Andre Dawson. I was quite happy to see that he was elected to the Baseball Hall of Fame in July 2010, and excited to actually visit the Hall in Cooperstown, NY a week later. I was happy that he was elected, and excited to visit the Hall and see his exhibit. Now just imagine my surprise as I'm leaving the Ubuntu Developer Summit sitting on one of Continental Airlines' smallest prop planes in Orlando, FL waiting to depart for Miami, FL. Sitting there, a luggage tag slides by me at eye level. There's a Florida Marlins logo, and a name, Andre Dawson. My heart skipped a beat with excitement. Andre Dawson was one of the 6 other people on my flight! "Mr. Dawson? I just wanted to say that you have been my hero since I was 8 years old. I loved the way you played the game, and wanted to play just like you. Congratulations on Cooperstown, well deserved! Would it be possible to take a picture with you?" He said, "Oh, uh, thank you, thank you, thank you. Sure." 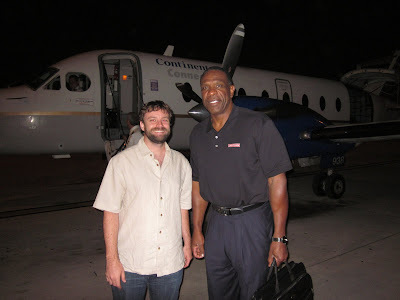 And, again, thank you, Andre Dawson. NICE! Andre, Ryno, and Jody were baseball coaches for the Cubs Camp I used to do as a scraggly little teenager back in the day. That is one of the things I will always remember growing up in Chicago, was hanging out with the greats of the Chicago Cubs and learning baseball from them. Extremely cool!!! Thanks for sharing! When I was 8, my hero was Arie Luyendyk (of course, since I'm from Indy). I saw him walking in Speedway (where the track is) once when I was just driving to a friend's house. I pulled over and had about a five minute discussion with him. It was fantastic.